Fine-tuning the kernel configuration file for the "La Frite"
The following assumes you have read the Linux kernel cross or native compilation instructions for the "La Frite". 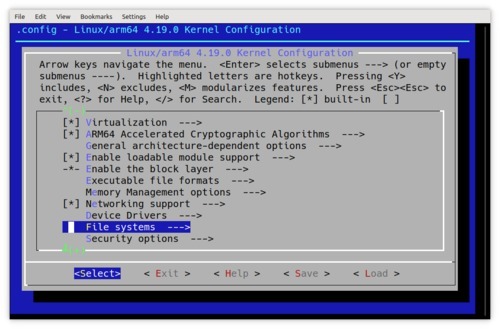 These include the basic steps for generating a default Aarch64 Linux kernel .config file. However, the default Aarch64 Linux kernel configuration file is sub-optimal for generating a kernel for the "La Frite". 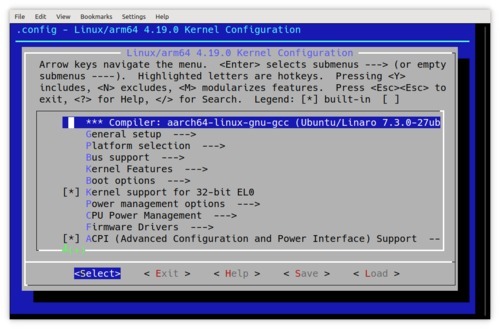 This is a quick guide on how to edit/fine-tune/customize the Linux kernel configuration file. IMPORTANT: the .config file should not be edited directly. Now, the secret to making proper changes to the kernel configuration file is to make them one at a time, so that's exactly what we are going to do. Scroll down to the File Systems submenu, then press Enter, then scroll down again until you see the btrfs filesystem support which is compiled as a module by default. We are going to change that so that the btrfs support is compiled in the kernel itself. 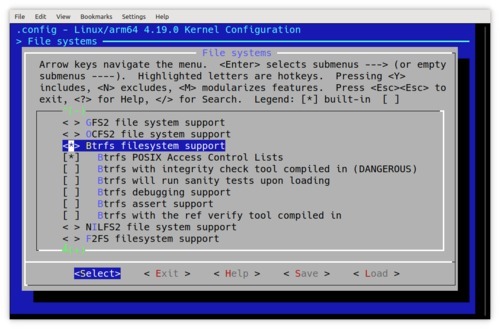 Pressing the space bar while the "Btrfs filesystem support" option is highlighted/selected will cycle through Module/Built-in/Not compiled options. We can now save the changes (press S), exit the menuconfig tool (press the Escape key) and proceed to compile the kernel. By default our changes have been saved to the .config file which is used by the make tool to build the kernel. However it's a good idea to backup this modified .config file and document the changes in an accompanying README file. The following are example optimized configuration files. Please upload any that you find interesting/useful and add a link to this table.